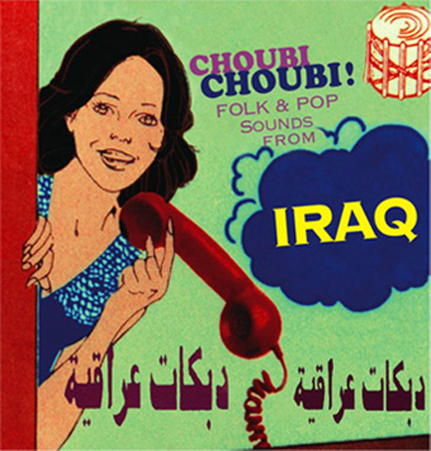 Meticulously selected from Iraqi cassettes and LPs found in Syria, Europe and the Iraqi neighborhoods of Detroit, Michigan, this unique collection of folk and pop styles displays a wealth of outstanding music that is exclusive to Iraq and has rarely been showcased abroad. There are many reasons why Iraqi music stands alone in the dynamic world of Arabic music: one example is the unbelievable rapid fire machine-gun rhythms fluttering atop the main tempo. This is the work of a unique nomadic hand drum called the Khishba –also known as the Zanbour (Arabic for wasp). A style prominently featured here is the infamous Iraqi CHOUBI -a driving rhythmic style that can include fiddles, double reeded instruments, percussion, bass, keyboards and oud over its signature beat. Other styles featured are the BASTA (an urban Baghdadi style), the BEZIKH, and the pulsating HECHA. Also heard is the MAWAL- a vocal improv that sets the tone of a song, regardless of the style. Additionally there are three cuts from Ja’afar Hassan’s 1970s record, "Let’s Sing Together". Being a folk-rock record, it’s a true anomaly for Iraq. Hassan was a mouthpiece for the Iraqi Socialist movement just a few years before Saddam Hussein. But most of the music in this collection was produced during the Saddam period– between the 1980s and 2002. Since the 2003 invasion and the wholesale disassembly of the country, classic tracks like these may already be part of a disappeared past. 2LP + bonus 7" edition of the original CD release from 2006.